Today I was tasked to help out Tye and Alex out on the deep side of the island. As a group, we needed to work on both Tye and Alex’s experiments and surveys. Before we headed out, we had a delicious breakfast of omelets and potatoes. It is nice having a hardy breakfast before a day of work here. When we got out to our first reef, we dropped down and started clearing basslets from Tye’s experimental ledges. It took us one and a half dives to finish up at Tye’s site and then we moved on to work on site assessments for Alex’s field study. 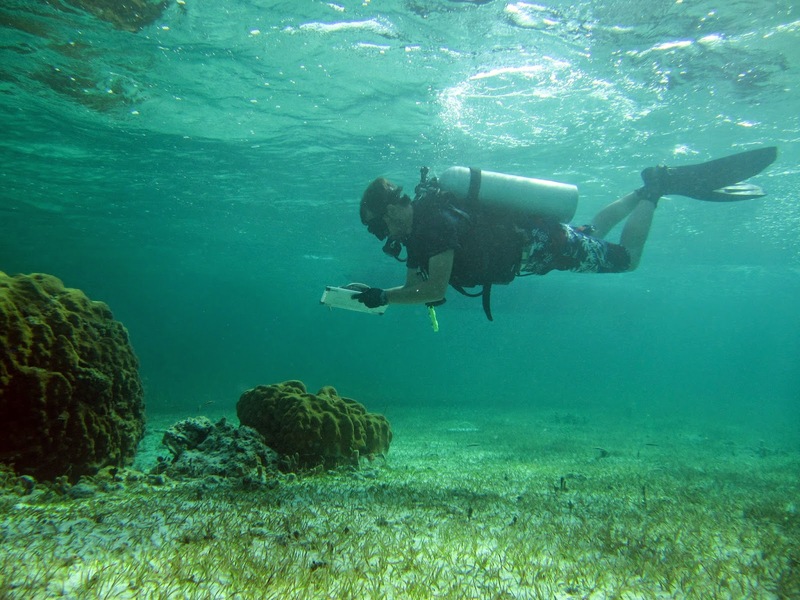 At each site, we would give Alex time to survey the reef from above and take photos and videos of the site. Then we would go around the entire reef and count the total number of lionfish present. Lastly, we would measure the length, width, and height of each reef to allow Alex to approximate the volume of the reef structure. During measurement, Alex and I would stretch out a meter tape to take the measurement and Alex would sign the number to Tye so she could record it. The funny thing is that we could have done this with two divers but we involved a third since there were three of us today. At our last site of the day, I had an interesting encounter with a sting ray. As I swam around the reef looking for lionfish, I noticed it buried in the sand next to the reef. It was not quite as big as the other sting ray I saw earlier this summer, but it was still quite large. I took a video of it when I came upon it and it swam off shortly after I started filming it (video of it here). After we finished up all of Alex’s reefs we headed back into CEI for the day. We ended earlier than in previous days with Lillian so that gave me some time to make arrangements for the trip down island with Erica. After dinner, I Skyped with Erica to make sure she has everything she needed to bring and then started to clean up and work on my blog. I am very excited about Erica’s arrival tomorrow! She will be here at around 5 pm which should be perfect timing for me finishing up work and Erica getting some dinner here. Now I’m going to sleep to make sure I have energy for tomorrow. Until later. Today was a very productive day for the OSU research team. It started off with me thinking that I slept through the weekly CEI staff meeting that our group attends but thankfully it got moved to tomorrow. Since I was still up a bit before I usually would be, I took care of Erica’s expenses for staying here at CEI before heading off to breakfast. Today Alex, Tye, and Stephanie stayed dry to work on our lab lionfish prey response experiment while Lillian and I went out to work on collecting gobies and working on the patches. Our task for today was to catch gobies and transplant them on Lillian’s patch reefs. We went to a site called Tunnel Rock on the deep side of the island to collect cleaner gobies. The cleaners are interesting in that they hang out on coral to present themselves to potential client fish. When a large fish stops near the goby and opens its mouth, the goby will swim into the mouth of the fish and clean the gills of the fish of parasites and other materials. 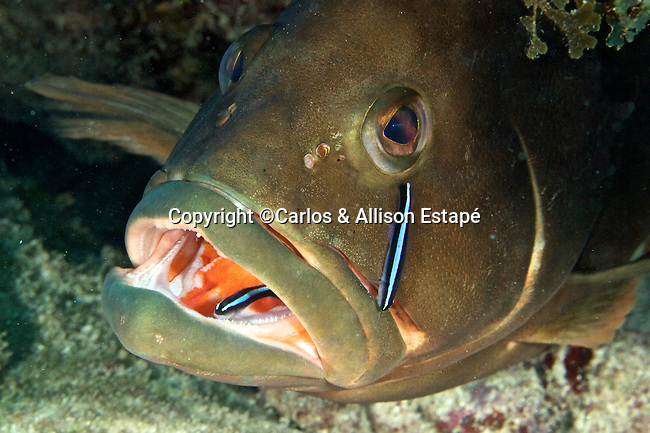 This is important for larger fish like grouper who can be significantly hindered by parasites in regards to their physical fitness if they are not periodically cleaned. The fact that the cleaner gobies lay on the coral made spotting them easy but catching them was a whole different story. They are very quick and small which makes it difficult to catch them. We used small aquarium nets to try to herd them off their coral perches and into plastic bags to be removed from the reef which worked reasonably well. Additionally, Lillian caught a trumpetfish while we were at Tunnel Rock to use for our lionfish prey response experiment. After the dive, we headed back into CEI to drop off the trumpetfish and eat lunch. After we finished lunch, we headed back out to the patches to release the cleaner gobies we caught on some of Lillian’s experimental reefs. At each of these reefs, we needed to remove all lionfish present before we added the gobies. We used the typical method of large hand nets and dry bags to clear out the lionfish. After the reef was clear, we added the gobies to particular coral heads on the reef and waited to make sure they stayed in place on the reef. Often gobies that don’t belong will attempt to flee the reef and look for where they came from. It is funny to say but we had to babysit them for a bit at Lillian’s reefs to make sure they did not try to flee away (pictured here). We did this at a few different reefs. One reef I accidentally caught a mutton snapper in the net instead of the lionfish I was going for which was surprising and funny. I stuck my net into this cave to coax out the lionfish when my net was pulled from my hand and a huge plume of sand arose from the hole. When the sand settled I reached in to grab the net and realized that I had inadvertently caught a snapper in the net. We let it go quickly to make sure it was not too stressed out and then we began to add gobies. We continued this operation at a few sites, with the last being the most interesting. On the last reef, there were three lionfish that we had to clear before we released the cleaners. They were a cunning bunch that avoided our collection nets at every turn. The second lionfish kept hiding away from Lillian but when she finally got it away from the reef, it bolted right into my open net (which I was not planning on happening or prepared for). It was certainly the luckiest lionfish catch I have had so far. We placed each lionfish one by one into a dry bag to be able to transport them back onto the boat (pictured here). After this site, we headed over to one last reef to catch some small prey fish for the lab experiment before heading back in. Once we got back to CEI, we took our bounty of 6 lionfish and a dozen or so prey fish over to the water tanks in the wet lab. We met up with the rest of our team to look at the tank they set up for the experiment which looked fantastic. We certainly have set ourselves up for success on this particular project due to Stephanie’s great planning and coordinating. At dinner, we placed the trumpetfish inside the aquarium tank at the dining hall since it was decided that we were not going to use it. It turns out that all the animals, even the lobster, in the tank were extremely hungry because they all started to attack the poor fish. I would imagine even if they were not hungry, they might have had similar reactions to today because of the confined space and territorial nature of the fish. It made me feel terrible about ever having an aquarium like that. Sure it looks nice but these animals are meant to live with other animals on reef structures with very different community assemblages than what is available for fish tanks. The only way I would ever consider having a tank like that would be if I made it into a functional replicate of a coral reef where all the organisms in the tank live as they would in nature (normal community interactions between species). We are hoping to get our first trial running tomorrow to test out the tanks and our methods for conducting the experiment. We had a long discussion tonight about this study and the details that are involved with executing it. Now a bit past 11 but I am beat tired from the long day and lack of sleep. Off to bed I go. Until later. Today I got up a bit early before breakfast to head over to the CEI offices so that I could pay for Erica’s accommodations here at CEI. It wasn’t until I stepped in the door to the office that I realized that no one was working today since it is Sunday. After realizing this, I headed off to breakfast and eventually down to the boathouse to get our gear ready for another day of fish surveys out at the patches. We took our time at breakfast which turned out to be a good thing because both of the boats our group was supposed to use today were being fueled at the marina. It took a bit longer than usual today for our boat drivers to fuel because they got stuck behind this huge private yacht that took over a thousand gallons of fuel to fill its tank. My guess is that this yacht is not the most fuel efficient boat in the world. We had to wait a while but once the boats came back to CEI, Lillian and I loaded up and headed out to the patches once again to do some more fish surveys. Once we got out to the patches, we had to re-anchor four times at our first site which was pretty memorable. The current and wind were going in very different directions very strongly today so it took a few tries to get the boat to hang in the correct direction near our first reef. After that we plunged in and got started with our survey on the first reef (myself pictured surveying the first reef of the day). We had a variety of patches that we visited today that had varying densities of fish. There were a couple of reefs that were particularly memorable that we surveyed today. 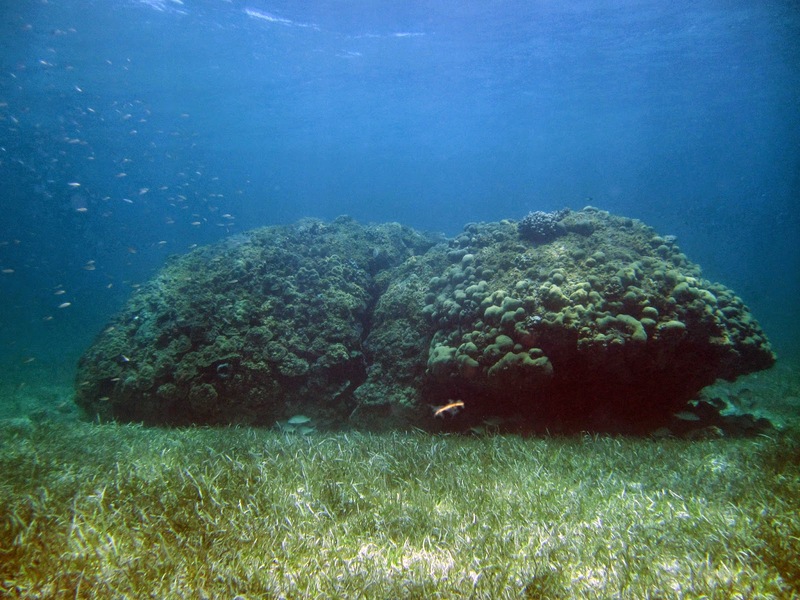 The first was this patch that was large and covered with live coral (pictured here). It was cool to see this much live coral out here and as a result, the fish community was abundant and beautiful. It was so abundant that we decided we would not count all the fish on the reef but instead identify all the species present on the reef and measure the fish that were representative for each species. After this reef we headed off to another reef that was also large but looked much different in structure and species composition. This reef seemed to be moving because there were so many fish on it. 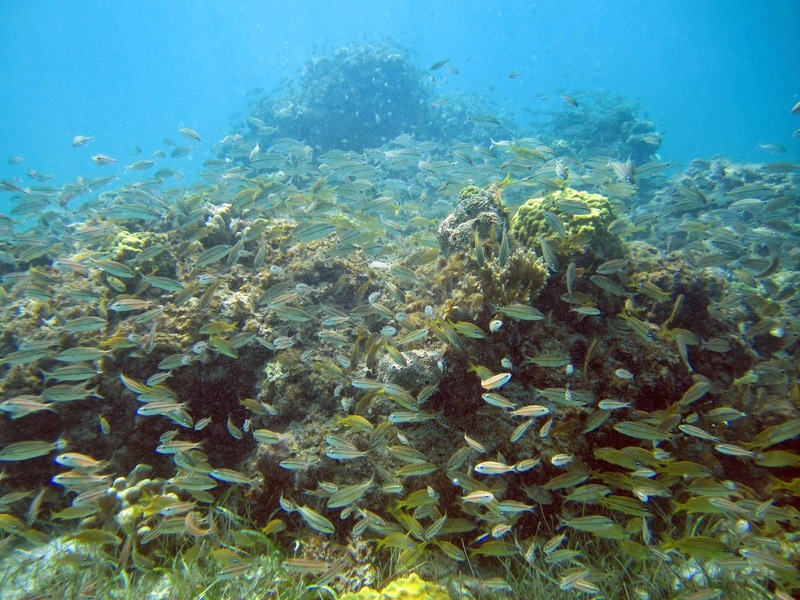 In particular, the reef was covered with juvenile and adult grunts of a few different species (pictured here). It was impossible to count all the grunts present on this reef so we just made some really rough estimates. We figured that combined the two species of grunt that we saw totaled over a thousand fish alone on this reef. There of course were many more individuals of different species on this reef which made this dive a bit longer than average. I had a hard time with this reef in part because of its size but mostly because of the number of grunts. Their presence in such great numbers here caused many of the reef associated fish to hide which made our job of counting and sizing fish much more difficult. Afterward we did a few more quick reefs before heading back into CEI. At the second to last reef we surveyed, Lillian finished her surveys a bit before me and took some photos of me at work counting and sizing fish (pictured here). Our evening was quite ordinary other than us doing dish crew again so I am not going to comment too much more. I need to Skype Erica to finalize some details about her trip before I go to bed so I must sign off. Until later. It was a bit rough getting up today. After a late night watching the Kings game, I was a bit drained this morning. I was able to shake it off pretty quickly though and by the time I got to breakfast, I felt fine. Over breakfast, Stephanie and I discussed the possibility of purchasing one of the USB LongShots we found online at Hardened Power Systems. These units are awesome because they allow you to plug a GoPro into an AC adapter using a USB cable to supply continuous power to the camera without having to worry about batteries (pictured here). Best of all, it is completely waterproof so we can use this to power a GoPro inside our experimental tank submerged underwater. After breakfast, we called in to the company that makes the LongShots to see if they could send us two on short notice to Erica so she could deliver them to us. The real issue with receiving parcels here is that packages are only delivered on occasion from CEI’s warehouse in Florida. This makes people who are traveling to Eleuthera the only viable options for getting deliveries quickly. As it turns out, the company was open today and we ordered two LongShots with overnight shipping to get to Erica before she leaves. The underwater GoPro in the experimental tanks will give us a vertical component to calculate distance between the lionfish and prey that we wouldn’t be able to have otherwise. We had packed up most of our things on the boat before we made the order so we could get on the boat and quickly head out to the patches once again. Once we got to our first site, I realized I had forgotten my booties. This was unfortunate because wearing fins without booties can give you bad rashes on your fight. To remedy this, I used some gauze and a sticky wrap to make padding on the back of my foot. It looked like I had some intense foot injury or something. Before I jumped in, Lillian, Stephanie, and I discussed a new method for doing the fish surveys. What we decided would be best is to observe the reef from afar to get the big counts. Then we would make a complete swim around the periphery of the reef keeping our distance to count any other large fish that were hidden from view before. After these distant observations, we would hover over the reef to count any smaller coral associated fishes that we couldn’t see before such as damselfish and wrasses. Then we would pass over the entire surface of the reef looking for cryptic species or fish that are hiding amongst or on top of the coral. Then we would swim around the bottom periphery of the patch to look for parrotfish and other small fishes that may be hiding in the reef or the turtle grasses around the patch. The idea is to have a standardized approach that would result in both observers (Lillian and I) to have the opportunity to see the same fish. All the while, I would be following Lillian around the reef at a distance (about 2 meters behind) so that I do not disturb her first observations. With this plan in hand, we got our stuff on and plunged into the water. Once I jumped in, I noticed my gauze padding worked ok but of course was not as comfortable as booties. The first reef went pretty well using this survey method and we decided to use it for the rest of the day. Throughout the day there were a number of fish at each reef that I would always seem to miss that Lillian would find (cryptic species like gobies and blennies along with Nassau groupers and Graysby that are hidden in the reef. I think with time, I will become quicker at observing and measuring the easily noticeable fish such that I will have more time to thoroughly examine the reef for the hidden fish. Just like yesterday, I felt more and more confident as the day went by. For our last dive of the day, we stopped at a larger patch reef to collect juvenile fish for our lionfish prey response lab experiment. We used hand nets to catch a variety of small fish (wrasses, damselfishes, and gobies) that were three or less centimeters to serve as prey for the lionfish (Stephanie pictured here after she caught a fish). We were able to do a long collection dive at this reef because it is in about 6 feet of water. After about an hour and twenty minutes, we called it quits and headed back in to CEI. When we got back we unloaded our gear and our cooler that we placed our prey fish in on a transport tricycle to carry our stuff over to the tanks in the wet lab (cooler of fish on tricycle pictured here). For dinner, we had some pasta and meat sauce which was nice after a long day of diving. Our OSU team had dish crew duties tonight so we were assigned to wash up dishes and serving trays that were used for the meal. There were only 15 other people that were eating with us so it was not too big of a deal. Before that though, Stephanie and I went off to the tanks to set up our dusk trial for the lionfish prey behavior experiment. After struggling to wrangle out the old lionfish, place a new one in with our prey, and turn on the GoPro, we went back to the dining hall to help with dishes. However when we got there, the rest of our team had already finished all the dishes. We headed back to Hallig and had our meeting for the evening to do logs and then I Skyped Erica for a bit to fill her in on some details about her upcoming trip. It is crazy to believe she will be arriving on Wednesday. I am very excited to have her come down and hang out with us in the Bahamas. I best get to bed now to try to catch up on some sleep. Until later. Today was my second day working with Lillian out on the patches. Before we headed out, Lillian needed to figure out which sites she wanted to visit for the day so instead, I went with Stephanie to work on the lionfish prey response experiment. We sat down with the head of the lionfish research program here at MSI to discuss logistics related to the project. Stephanie during the meeting mentioned me as the head of this project after she leaves which I was very happy to hear. This will give me a great opportunity to execute an awesome study and potentially have some sort of authorship on the resulting publication. I am very excited to see how this study progressed over the course of the summer. Once Lillian was ready to go, I went with her to go out to the patches while Stephanie stayed behind to set up a trial for our experiment. The weather could not have been more different from yesterday. We made our way out under sunny skies and a light breeze. Once we got out there, we discussed what I would be doing for the day. I was surprised to find out that I was going right into doing fish surveys with Lillian as the second observer. We discussed the general plan of how we would survey the reef and got right to it. Once we got in, I was blown away by the patch reef. It was teeming with fish and I must admit that it was completely overwhelming for me. I identified and sized as many fish as I could and then stopped after I realized I was causing Lillian to wait for me. When we came up, I was happy to hear that many of my fish length estimates matched up well with Lillian’s. It was clear however that I had a lot of work to do in order to improve my speed and observational skills. I will certainly never forget that reef. As we did more survey’s, I began to get the hang of what I needed to do in order to effectively estimate the number of fish and their sizes on these patch reefs. By the end of the day, I felt much more confident. My last reef we did was pleasant despite its size. We saw a cute little nurse shark hiding in the middle of this cave in the reef. Since I was in reef fish counting mode, I totally forgot to take a picture of it when I had the chance. After we finished up, we went back to CEI, had dinner, and did our logs. When we finished, Stephanie, Alex, and I headed over to the tanks to check up on our lionfish prey experiment. We noticed that the night vision feature of the security camera system CEI researchers had setup for the trial were not nearly good enough to visualize the prey and the lionfish at night. This is actually ok because we will not be doing trials at night but rather at dawn, during the day, and dusk when they are most actively hunting. Regardless, we are thinking about using GoPro cameras for the whole project because they have a much greater field of view and produce much higher quality of video. Once we finished up, I turned on the Kings game to watch with Stephanie and Lillian. We all had our dark and stormy adult beverages to drink and enjoyed some intense Stanley Cup hockey. Both Stephanie and Lillian were not able to hang around for the whole game since it did go to double overtime. Eventually, the Kings won the cup and it was awesome to see it end in overtime in Los Angeles. It was an amazing celebration for an amazing playoff run by the Kings. Wish I could have been there to see it. Being here in the Bahamas doing what I love though is not a bad alternative. It is super late now so I best get to bed. Until later. Today was a start to a new chapter for me in the Bahamas because I was assigned to work with a new PhD student today named Lillian from OSU. She is interested in studying species of fish (cleaner gobies) that clean the gills of larger fish of parasites and how this mutually beneficial interaction between cleaner and client species (the fish cleaned of parasites are called client species) could be altered by the presence of invasive lionfish (cleaning picture from the internet). Her work will be mostly based in the patches this summer which lie out in the uniformly shallow waters of the sound directly off shore of CEI. Because Lillian had some things she needed to do before our trip out, we didn’t leave until around 11 am to go out to the patches. In the time between when we left and breakfast, I went over to the CEI office to finalize Erica’s planned dates that she will be staying at CEI. It turns out that the group that would have a member stay with me while Erica is here pushed back their arrival date to June 30th. This will work out better for us such that Erica and I will be able to vacation up island at the end of her stay here on Eleuthera. Once we headed out from CEI, we made our way to a large array of patch reefs in the sound. My job today was to approximate the sizes of the patches, describe their structure and coral composition by percent cover of coral, and to count and size lionfish. 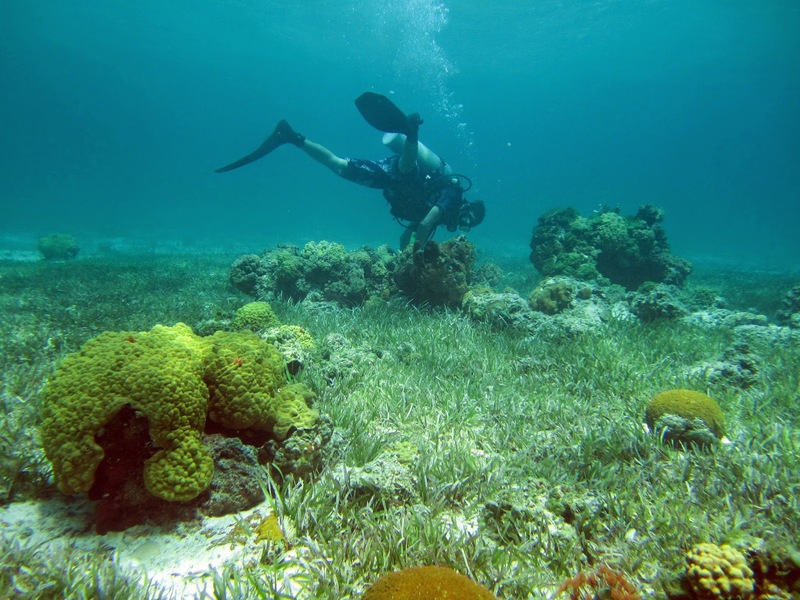 Since the patches are only in about 10 feet of water, it is much easier, safer, and quicker to snorkel for the recon of these reefs. We moved quickly from patch to patch spending about 5 minutes or so at each one. Our boat driver Jeremy live boated for us so that we didn’t need to anchor at each site. After 6 or so reefs surveyed, we stopped for lunch at around 1 pm when it was super calm and sunny out. Over the course of the next hour though, it began to get cloudy once again and the winds started to pick up. Soon the wind swell was reaching 3-4 feet tall with heavy rains. It got to the point where it was no longer safe for us to be pulling ourselves onto the boat in such conditions. At our last site, we were uncomfortably being tossed around on the surface as we took data. As we were about to leave and get back to the boat, I noticed a lionfish that I hadn’t seen while I was surveying. I dove down to estimate its size and as I made my way back up to the surface, I saw a large nurse shark swim out of nowhere underneath me. It proceeded to stick its head under a small ledge where I had spotted 2 Caribbean lobsters hanging out. I’m pretty sure this nurse shark was looking for a nice tasty lobster to eat and it was astonishing to see it just wedge its head underneath a ledge like that to get one. I sat and watched the shark thrash about under the ledge for about 15 seconds before I swam back to the boat so we could get out of there. Once we got topside, it was pouring with the winds howling all around us. We started back to CEI very slowly so that we wouldn’t roll in the large, choppy swell. As we made our way through the storm, we were constantly being splashed and thrown around by the relentless wind swell. As this was happening, all Lillian and I could do was laugh about it. It was certainly nice to be in the company of a person who found the entertainment and humor in a situation like that. Even though we weren’t in any immediate danger, situations like these would make many people overly uncomfortable. But for Lillian and I, we thought it was a pretty fun to experience. Once we got back to CEI, we cleaned up and ended early. We had planned on coming back in later and looking at more patches but of course the weather just didn’t cooperate today. It was another day of storminess at Eleuthera in the Bahamas and so it was nice to hunker inside and to work on my blog and emails. After dinner, we did our logs as usual and soon thereafter marveled at Tye’s enormous catch of the day. She captured a 41 cm lionfish today before the storm hit them out on the outer side of the island. Even though they planned to release it out on one of Tye’s high density lionfish reefs, they didn’t end up having enough time after having to wait out the storm in a nearby harbor. As a result, she brought the lionfish back to CEI and it will soon be a nice meal for us (pictured here). We decided to wait on filleting the fish so that the lionfish research group here at CEI could remove the gonads and stomach for analysis. Gonad mass as well as stomach content can tell you much about the how often the fish may reproduce and what it has recently been eating. 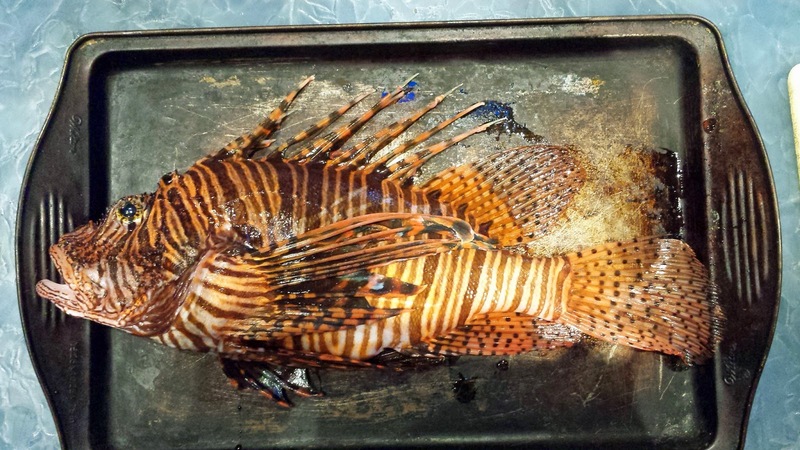 Sometimes, researchers here at CEI have found as many as 30 or more juvenile fish inside the stomachs of large lionfish like this one which is pretty incredible. After snapping some photos, we all retired to our rooms and I am now finishing up my blog for the night. Hopefully I will get to looking at some possibilities for lodging for Erica and my trip up island tonight before bed. Until later. Today our OSU group had a short meeting before breakfast. We toured around the water tanks area to begin to plan out what we would do for our lab experiment on lionfish prey behavior. At this point, it appears that we will be using this home security camera system that one of the researchers at CEI has used in the past to observe lionfish. We discussed possibilities for camera arrays and then went off to breakfast. Today was Alex’s first dive day. She came down to the Bahamas with a minor ear infection and had to finish off her antibiotics before she could dive (which happened yesterday). She joined Tye and I to do some site recon for Alex’s habitat project. It was a productive morning in which we visited a handful of prospective sites. In the early part of the afternoon, we dove a couple of Tye’s experimental reefs to see if it would be suitable for Alex’s study. When we came up from the second of Tye’s experimental reefs, the sky looked dark and ominous. We all made the observation getting out of the water that the weather sure had changed for the worse. It was clear that we needed to head in as we started to see lightning offshore from where we were. We started to head very close to the shore on the way back but as we did the weather got worse and worse. Wind swell was at times 5-6 feet and the wind howled along with the crashing thunderous sounds off in the distance. Tye and Alex were really concerned as this was one of the worst storms they had ever been stuck in. We nearly decided to anchor the boat and swim to shore to wait it out but we made a decision to press on thinking the storm would thin out as we headed toward CEI. It turns out that the opposite was true. The going was slow and we moved along at a deliberate pace to try to get away from the storm while simultaneously trying not to flip the boat (the swell was that big). It turns out that the system dissipated eventually and we were able to make it back to CEI safely. It was certainly not an adventure for the faint of heart. We sat down to have lunch at the boathouse while we waited for the storm to pass. The storm moved very slowly so we had to wait over an hour before we were able to think about going back out to the sights Alex wanted to visit today. 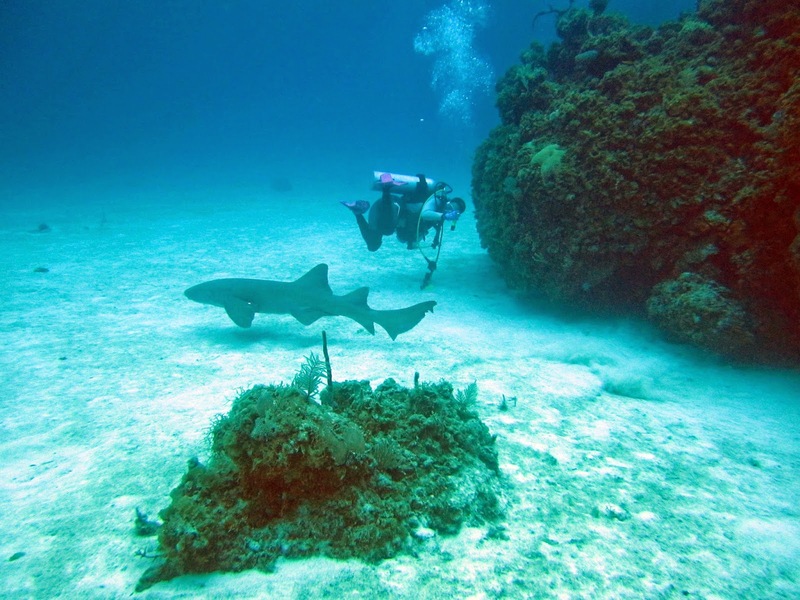 heard a high pitched scream and out came an even larger nurse shark right next to her. It quickly swam off past Alex but I could tell she was startled by it as it just appeared out from the cave. As I swam around the reef to look for lionfish, I spotted another opening to this cave and was able to see 3-4 nurse sharks piled up on top of each other. 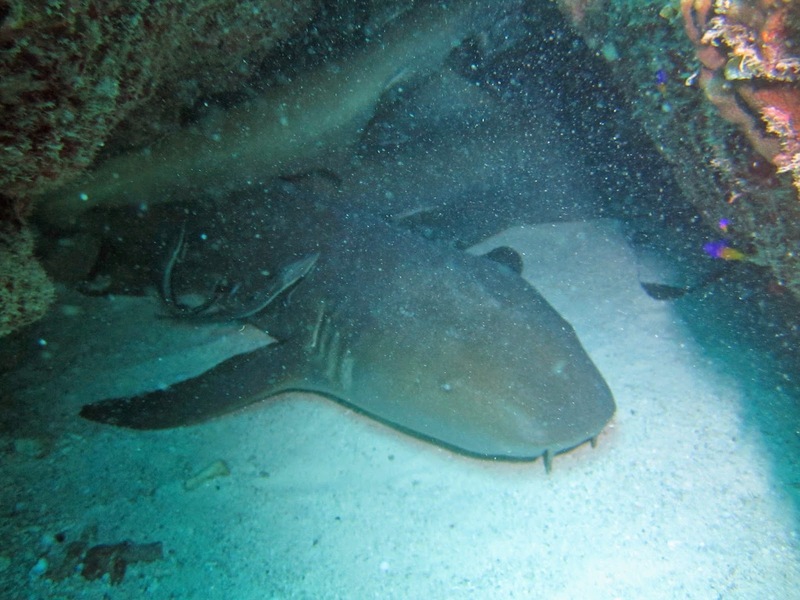 Apparently right now it is mating season for the nurse sharks so it is possible that this cave was a safe place for them to copulate. 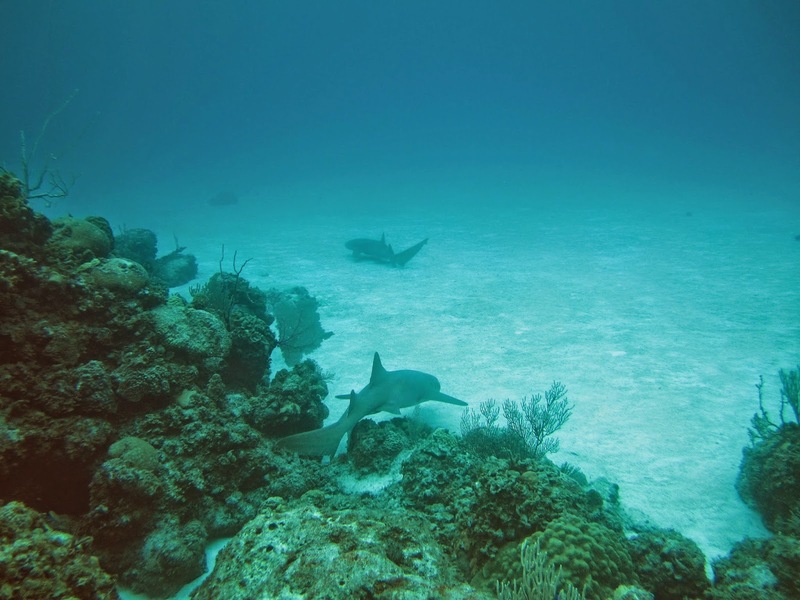 I took some pictures as I peered through the hole (pictured here) and just the same as with what happened to Alex, 4 nurse sharks in a delayed succession came darting out of the hole underneath me. It was startling to see them come out of this hole because they seemed to barely fit through due to their large size. After all this happened, I kept thinking to myself that I should have had my GoPro to film that. We finished off our field day with a couple more dives to count lionfish for Alex. They were also cool sites that had interesting structural features (one was shaped like a banana). Throughout the day, we measured and counted lionfish to assess whether there were enough present of Alex’s study. After we finished for the day, we came back to clean up and went to dinner. Since it was the last night the Island School students were here at CEI, they prepared a Thanksgiving like dinner with mashed potatoes, green bean casserole, and turkey which was delicious. Afterward we came back to do our logs for the day at Hallig. We got through those pretty quickly and then had some dark and stormy rum drinks to cap the day off. I stuck around inside the Hallig lobby to watch the Kings game with Lillian. Unfortunately the series did not end tonight but on the bright side, the Kings have a chance to win at home in Los Angeles. After a few drinks and a long day I am super tired so I am going to head off to bed. Until later.